The peppers on these open-face sandwiches are better than anything you can pull out of a store-bought jar: Sweet and mildly spicy peppers are pan-roasted over high heat to make you think they’ve spent time on a grill. Then they soak in vinegar, oil, garlic, and fresh basil, and are piled deliciously atop tangy goat cheese–spread toasted bread. The peppers are also delicious on pizza, in salads, or as a part of an antipasti platter with olives, cheeses, and raw veggies. For the tartines, use a boule with a nice crust and a dense crumb. For bite-size crostini to serve as an appetizer (great with cocktails), use about 20 slices of a baguette-style bread. 1. Heat the 2 tablespoons of oil in a large skillet over high heat. Add the peppers and 1/4 teaspoon of the fine sea salt and cook, turning often, until the peppers have lost all firmness and started to blacken on the edges, 7 to 10 minutes. Remove from the heat. 2. Combine the vinegar, garlic, sugar, the remaining 1/4 teaspoon of salt, and the black pepper in a large, wide-mouth jar. Add the warm peppers and stir them until they are fully coated with the vinegar mixture. Let the mixture stand for 30 minutes, then add the remaining 1/2 cup of olive oil and half of the basil. Stir well, and let it stand for another 30 minutes. Serve immediately or, ideally, cover the jar and chill overnight for maximum flavor. You can store the peppers in an airtight container in the refrigerator for up to 1 week. 3. 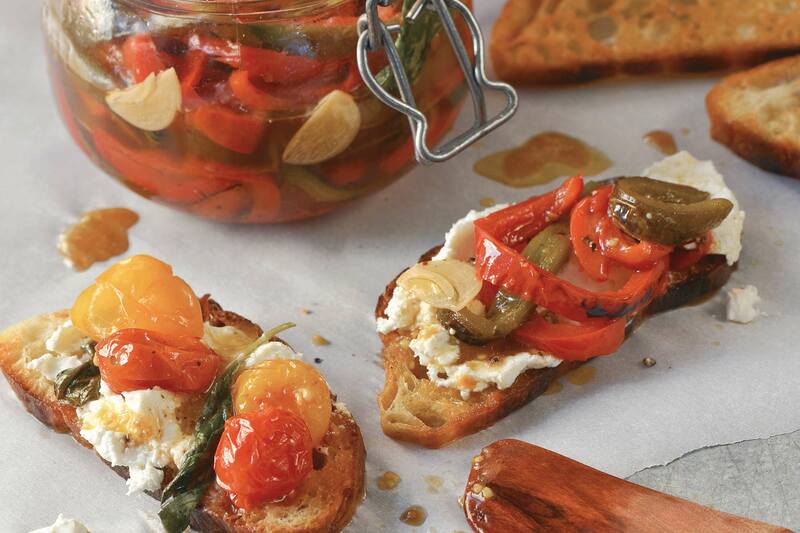 Before assembling the crostini, bring the marinated peppers to room temperature. Spread the cheese atop the crostini, dividing it evenly, then top with a spoonful of peppers and the remaining basil ribbons. Sprinkle with flaked sea salt and the toasted pine nuts if you wish. Note: You can use another sweet pepper in place of the poblano pepper if you wish.